OK, so maybe not quite as wonderful as that first start up after a long engine rebuild! Or eagerly awaited trick bits turning up in the post. Or lining up for the 1/4 mile or a track day. Or finally getting your jetting spot on… I could go on. Anyway, it’s that time of year again soon. You know, the time to sneak off from family/sprouts/other responsibilities into the shed to ‘get some more beers’ whilst secretly spending ages looking at your bike / pile of bike parts. The time to make plans for the new year to finish or maybe start that project. 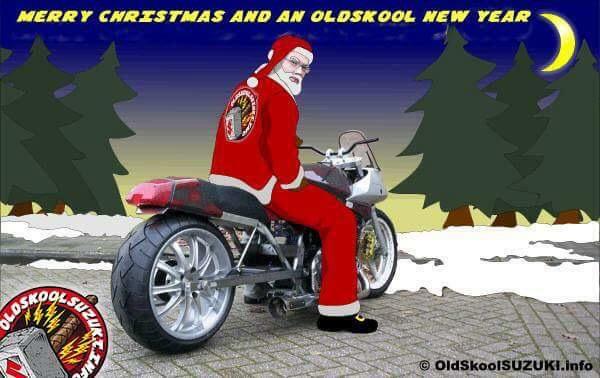 Oh, and of course the time for us to wish everyone a very Merry Christmas and an Oldskool New Year. No matter what your views or beliefs about Christmas you are always welcome here at the church of OSS for our carol service played on instruments of flatslide chatter, mulled turbo whine and barely silenced heavy engines. You can stick your gold, frankincense and myrrh up your exhaust outlet though, bring us unobtanium Suzuki and Yoshimura parts instead. Thank you to everyone for your contribution to and support for OSS this year, including our moderator and event moderator team. Best of luck and every success to our winged hammers racing next year too. This year, we are giving you the chance to win an OSS sticker and a box of delicious OSS mince pies! We may even find a sticker pack lying around in Hamma-shin’s grotto that we’ll send to the lucky winner too. For your chance to enter and full terms and conditions look here. Merry Christmas and an Oldskool New Year from the OSS admin team*. Last and by no means least though, thank you to everyone for your contribution to and support for OSS this year, including our moderator and event moderator team. Best of luck and every success to our winged hammers racing next year too. Discuss this article / eat / drink / be merry here.